BBC Connected Studio–HPSN Pilot here we come! So, you may have seen our recent blogs about the BBC Connected Studio for Homepage, Search and Navigation – Creative Studio and Build Studio. So far the experience has been an incredible one. The BBC have run two fantastic events that have been very well organised and almost militant with their timing. In brief, the Creative Studio had 32 teams presenting which was then whittled down to 9 for the Build Studio. It sounded like the BBC judges had an incredibly hard time in choosing the finalists to go into the funded 6-8 week rapid prototyping Pilot phase because there were some incredible ideas amongst the 9 participants. We are really pleased however, that we have been chosen as one of the three teams to go through to the Pilot stage. The other two are Kent Lyons and Goss Interactive so congratulations to both of those as well. Our original concept in the Creative Studio combined a number of ideas including a time based homepage combined with varying levels of manual and automatic personalisation and the semantic web. 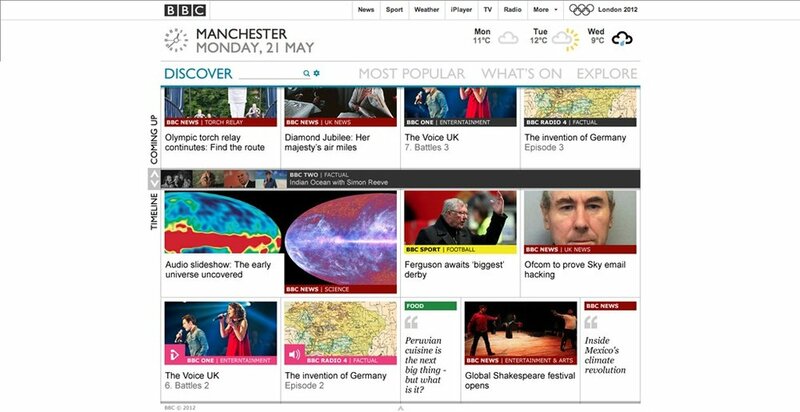 In the Build Studio we had 2 days to focus on one idea and the BBC wanted us to explore the timeline view. It was a bit of a risk but the team chose to rebuild the prototype for the homepage from scratch using Node.js (rather than using the existing PHP codebase that was provided) in the 2 days allocated. This was integrated to real BBC data and demoed at the end of the 2nd day. So, in the Pilot we will more than likely be taking the timeline view further and making it production ready. We haven’t yet defined the requirements for the 6-8 week project and it going ahead is subject to some business case analysis and agreement being reached on costs, deliverables and timescale. If it does go ahead however, once we have built it, the pilot will be live to the public on the connected studio site so the BBC can gather some real feedback before making a decision on whether to implement it into bbc.co.uk. So far the Connected Studio has been a great experience. We have given the opportunity for a a number of our staff to be involved (the team for Build Studio was entirely different to Creative Studio) so it feels like it has been a real team effort. We' can’t wait for the pilot to begin.